An experienced church embroiderer told me, “something special always happens when you are making an altar frontal”. 2006 was a cold winter, mists on the River Colne, short hours of daylight to work in. I was struggling for ideas, visiting and talking to other women who had made altar cloths elsewhere, planning designs, thinking about shapes and fabrics. The church seemed dark in these months, I wanted to bring in reflected and borrowed light by the use of the right materials. The colours of the stained glass windows, the golds and blues of the wooden panels behind the altar gave me a base colour scheme. It was a place to start. 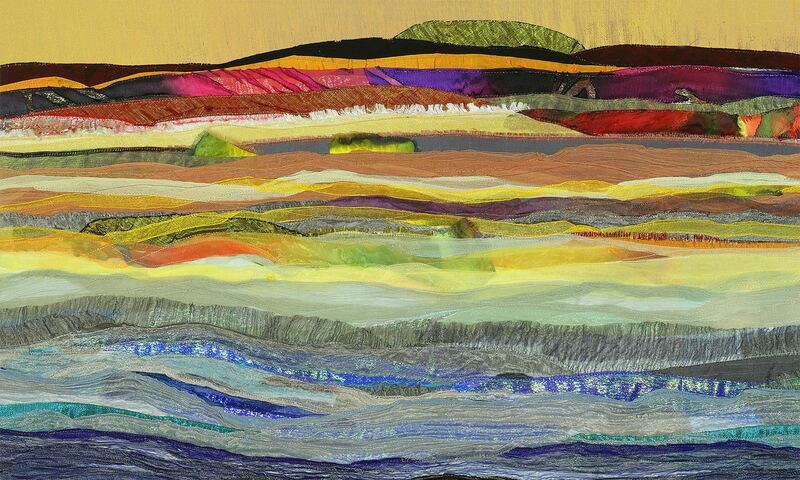 I had silks from the Far East and India offering subtle colours, beauty and light. I could choose to make it complex but wanted to aim for simplicity. 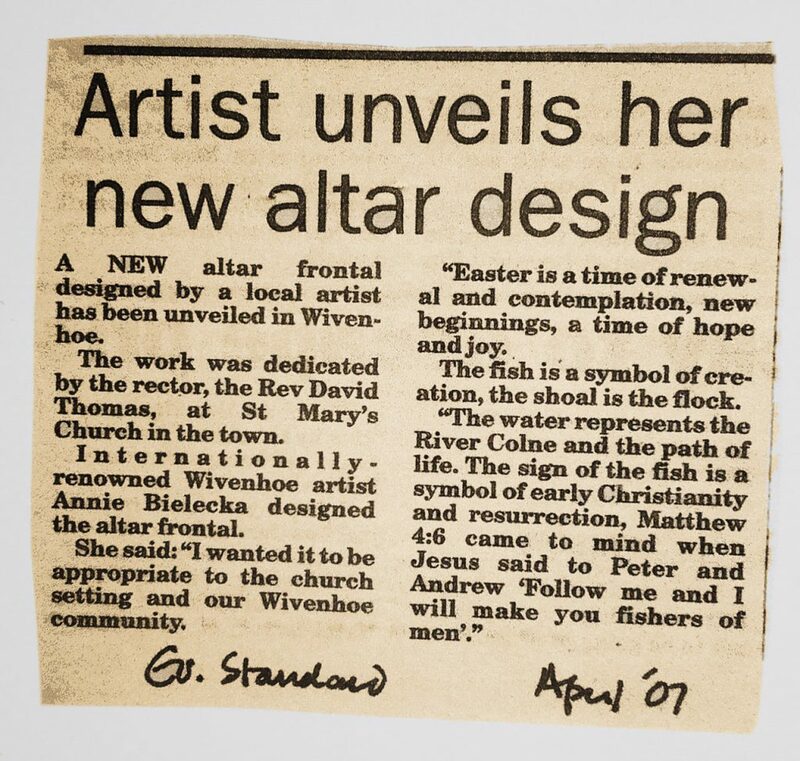 More than anything, I wanted it to be appropriate both to the church setting and our Wivenhoe community. Wivenhoe Remembered was being published, telling the people’s oral history of the river and the town, a film was being made too. 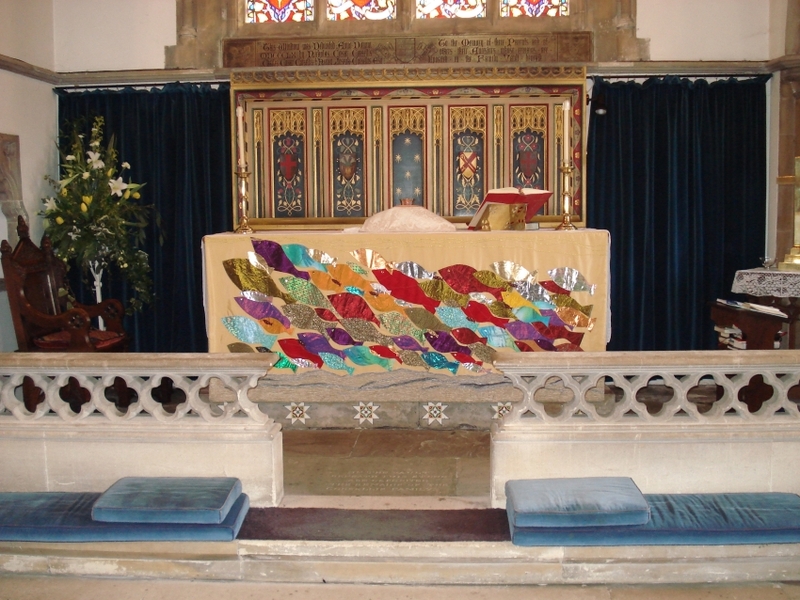 Rev David Thomas had asked me if the altar frontal could be ready and finished for dedication on Easter Sunday 2007. As I thought more about it, I kept remembering a beautiful and very important altar cloth at Stirling Castle Chapel in Scotland, made in perpetual memory of the children killed in Dunblane School. It has an embroidered star for each child. Seeing this cloth moved me and made me think of all those in our community who had passed on before their elders. I have been to many funerals and memorial services in this church. St Mary’s is at the heart of this community whether one is a regular worshipper or not. Some families do not have a grave marking the lives of loved ones, especially those lost at sea. This became my inspiration and I knew then how the design would plan out. So, this is my wish — to dedicate this work to the memory of those we knew and loved who have died too soon. I hope you will join me in this. Easter is a time of renewal and contemplation, new beginnings, a time of hope and joy. The fish is a symbol of creation, the shoal is the flock. The water represents the River Colne and the path of life. The sign of the fish is a symbol of early Christianity and resurrection, Matthew 4:6 came to mind, when Jesus said to Peter and Andrew “Follow me and I will make you fishers of men”. Special thanks to: Auriol Ashworth, Helen Jenkins, Supervisor of Norwich Cathedral Broderers’ Guild, Alice Kettle, Janine Wyman of Designworks, Wivenhoe.